The SUBMIT button in the comments sections does not appear in “Google Chrome” Browser. But it appears in other browsers. Please help me to fix it. 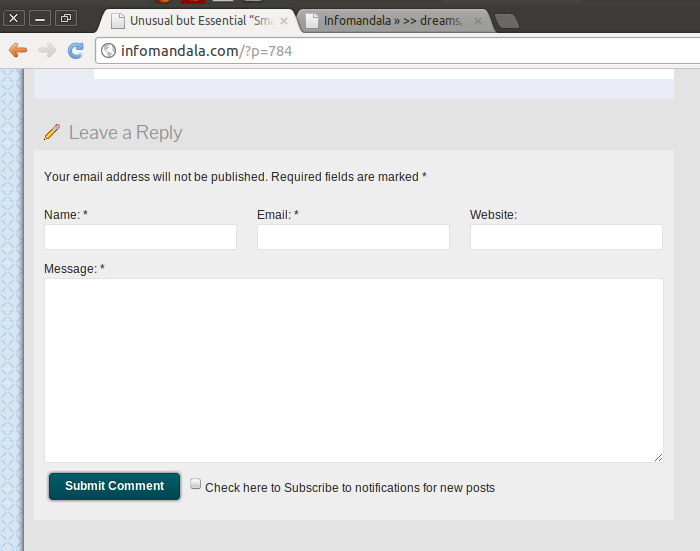 Also, if there is any other post in this forum related to the above issue, please let me know. Thank you Prasanna…. I really appreciate for your time. But its really Strange… Its not appearing in my system and many of my Friend’s as well!!!! #PS: And could you please let me know how to paste Image here? Just wanted to know if there is a way I can do without hosting it online! #PPS : Just Thought of visiting the “Graphene Theme Tutorials” of your website but the link in the Signature says that its OFFLINE!! In Chrome, go into “Incognito mode” and visit your site. This will shut down any extensions you have installed on Chrome. If you can see your button, it’s probably an extension conflict with Chrome. And could you please let me know how to paste Image here? Just wanted to know if there is a way I can do without hosting it online! I take it you mean “without hosting it on my own site”? Use http://imgur.com. If you upload the image there, you can link directly to the image here. And could you please let me know how to paste Image here? Just Thought of visiting the “Graphene Theme Tutorials” of your website but the link in the Signature says that its OFFLINE!! It should be online now. There is nothing much you can do for this. Chrome is a miniature of IE in terms of weirdness. It may be a certain extension, or a combination of them. You can try playing around with different combinations of extensions to see if one of them in particular is causing the issue. Chrome is a miniature of IE in terms of weirdness. Wish this forum had a “Like” button. The trend at my job is toward Chrome, which I am resisting because of it’s weirdness.